Studies of differences in average unemployment rates across countries have focused almost entirely on comparisons between Western Europe and the US. This is for good reason, of course, as Europe-US unemployment gaps are well known to be large and persistent. Countries like Spain and Ireland have had unemployment rates north of 12% for decades running, while the US has averaged around 6% since the end of World War II (e.g. Nickell 1997). By contrast, systematic comparisons of average unemployment rates between rich countries and poor countries are largely absent from the literature. There is little mystery about why this is: there is simply very little internationally comparable unemployment data outside the world’s advanced economies. As a result, claims about unemployment in poorer countries are all over the map, with some studies finding that the highest unemployment rates in the world are in Sub-Saharan Africa, at around 30% per year (World Bank 2004), while others posit that unemployment is almost non-existent in developing countries, since people there are too poor to have the luxury of not working (Fields 2004, Squire 1981). In our paper (Feng et al. 2018), we contribute to the study of unemployment by building a data set of average unemployment rates covering 84 countries of all income levels. To address the issue of data comparability, we intentionally bypass existing data banks, such as those of the ILO, and build our own measures of unemployment from the ground up using household survey data. We draw on 199 nationally representative household surveys conducted in various recent years (but mostly between 2000 and 2010). Importantly, our data cover not just the rich countries of the world, but many poor nations, including a dozen from sub-Saharan Africa and many more from the middle of the world income distribution. whether the worker is searching for work. We define work as wage employment, self-employment, and unpaid work in a family farm or business. We exclude those doing home production of services like cooking, cleaning, and childcare. Our search measures cover job search activity in some recent period, like the last week (in our preferred metrics). We compute unemployment rates in each survey as the number of adults not working but searching for work / (number working + those not working and searching). We then average over all surveys for each county in our data. What we find is that average unemployment rates are in fact substantially lower in poor countries than in rich countries. In the poorest quartile of the world income distribution, unemployment averages around 2.5%, while in the richest quartile, around 8% of the labour force is unemployed on average. Interestingly, we find that the higher unemployment rates of richer economies hold for workers of all ages, for men and women separately, and within both urban and rural areas. Thus, our data suggest that unemployment is largely a rich-country phenomenon, rather than a feature of underdevelopment. Why are unemployment rates lower in poorer economies? Our answer to this question is guided largely by our findings for unemployment rates by education level. Surprisingly (to us anyway), the data show that unemployment rates for the more educated (proxied by those with secondary school education or more) have almost no trend in GDP per capita. In contrast, unemployment rates for the less educated are very sharply increasing in GDP per capita. These two facts together account for virtually the entire pattern of aggregate unemployment rates by country income level. They also imply that the ratio of unemployment for the less to more educated is increasing in income level. The figure below plots the ratio of unemployment for the low educated to that of the high educated against the log of GDP per capita. In the poorest countries, this ratio is below one, meaning that the low educated are less likely to be unemployed than the high educated. The exact opposite is true of the richest countries, all of whom have ratios above one. For instance, in the US, the ratio is 2.3, meaning that those without high school education are more than twice as likely to unemployed as those that finished high school (or went on to college or beyond). Whereas one might have thought this pattern is a universal feature of labour market outcomes, our data show that unemployment concentrated among the less educated is actually confined to richer economies. We then build a stylised model of unemployment through the development process, to try to help explain the facts we document. The model features two broad sectors, which we call the ‘modern’ and ‘traditional’ sectors. The modern sector has several of the hallmarks of a modern economy: frictional labour markets, where firms and workers must search and find one another in order to produce output, and production that depends on worker skill. The traditional sector captures the main features of the informal sector or subsistence home production: self-employment, output that is not based on skill, and free entry (Parente et al. 2000, Fields 2004). Workers are heterogeneous in their skill level and sort into the sector that maximises their expected income (as in Roy 1951). Workers that choose the modern sector begin as unemployed workers and must search for a job. When they find it, their wage depends on their skill level, and with some probability they become unemployed again each period. Those entering the traditional sector begin work immediately and produce output without regard to their skill level. 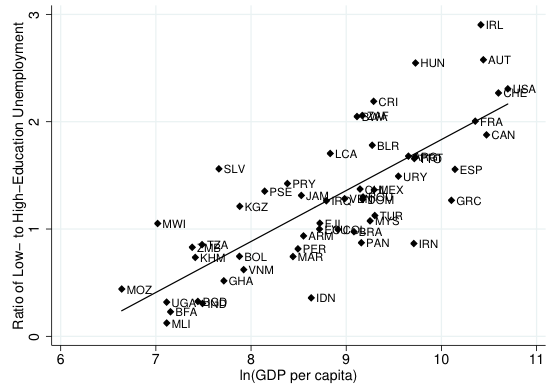 Countries differ only by their productivity in the modern sector, with the traditional sector offering the same (low) level of output per worker in all countries. This assumption is central to our analysis and based on the emerging consensus that cross-country productivity differences are skill-biased, rather than affecting unskilled and skilled tasks and workers equally (Caselli and Coleman 2006, Malmberg 2016). The model predicts that in countries with low modern-sector productivity levels, the bulk of the workforce sorts into the traditional sector. Only workers with the highest skill levels choose the modern sector. Then, as modern-sector productivity rises – our proxy for ‘development’ – more and more lower skilled workers are drawn into the modern sector. This raises overall unemployment, as more workers now search for jobs, with some of them being unemployed each period in equilibrium. As in the data, our model predicts that development also brings a rise in the ratio of unemployment for the less- to more-skilled. The reason is most of the higher skilled workers are already in the modern sector and searching for wage jobs in poor economies. As modern-sector productivity grows, it is the less skilled workers that switch sectors, and their unemployment rate rises faster as a result. Our research suggests that unemployment is largely a feature of advanced economies. In poor countries, only the most skilled workers search for wage jobs, while most of the less skilled workers select into traditional self-employment activities. Thus, few workers in poor economies are actually unemployed in practice. In advanced economies, the modern wage-paying sectors have relatively high productivity levels and employ the bulk of the labour force. As a consequence, as modern firms and positions come and go, workers are occasionally cast into unemployment. While unemployment per se is undesirable, the high underlying productivity level of the modern sector is not. Caselli, F and W Coleman (2006), “The world technology frontier," American Economic Review 96(3): 499-522. Feng, Y, D Lagakos and J Rauch (2018), “Unemployment and development,” Unpublished Working Paper, University of California San Diego. Fields, G (2004), “A guide to multisector labour market models.” Cornell University ILR Working Paper 86. Nickel, S (1997), “Unemployment and labour market rigidities: Europe versus North America,” Journal of Economic Perspectives 11(3): 55-74. Malmberg, H (2016), “Human capital and development accounting revisited," Unpublished Working Paper, IIES Stockholm. Parente, S, R Rogerson and R Wright (2000), “Homework in development economics: Household production and the wealth of nations," Journal of Political Economy 108(4): 680-687. Roy, A (1951), “Some thoughts on the distribution of earnings," Oxford Economic Papers 3: 135-146. Squire, L (1981), Employment policy in developing countries: A survey of issues and evidence, Oxford University Press. World Bank (2004), Unlocking the employment potential in the Middle East and North Africa, MENA Development Report.